The Canton-born, Ma Mon Luk came to the Philippines in 1918, after being spurned by the parents of his sweetheart Ng Shih, for having a low-paying teaching job. He vowed to make a glorious return to his beloved after finding his fortune in a new country. Once settled in Manila, Ma Mom Nluk became an ambulant vendor of “gupit”—a street term for noodles (the strands were cut by a pair of scissors) in chicken or beef broth. He found many patrons around Ongpin—mostly Ateneo and Letran students who lingered after a game, and who bought 5 centavo bowls of mami from the China man who shared stories of his hard life in China. Eventually, a patron offered him a space for rent on T. Pinpin St. where he built a steady stream of clientele. In time, he opened his own Ma Mon Luk Restaurant on Salazar Street, in the heart of Chinatown. He relentlessly promoted his mami by giving away his calling cards that came with a free siopao offer upon visit to his restaurant. He distributed his products in offices, donated siopao to typhoon victims, and offered the stuffed buns to personalities like Pres. 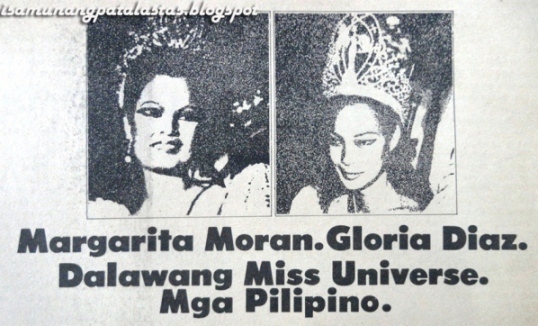 Sergio Osmeña, Amang Rodriguez, Flash Elorde and Carmen Rosales. In 1948, he opened a branch along Azcarraga st. (Recto) and two years later, moved to Quezon Boulevard, near Life Theater. 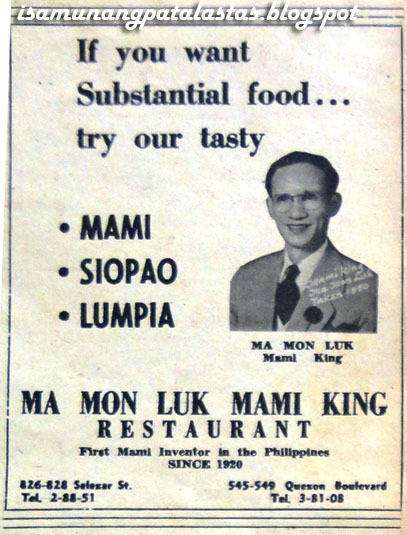 This Ma Mon Luk Restaurant became his flagship brand, which often served over a thousand orders of mami and siopao daily. With his success, he began acquiring prime real estate property and built himself a mansion in Quezon City. And, oh yes, he kept his promise to Ng Shih; he came back for her and took her to the Philippines where they raised 4 children, William, Robert, Irene and George. After his death in 1961, his children inherited the mami-siopao empire and became Filipino citizens, a gesture of gratitude to the adopted country where their father’s dreams were all realized. 12. DID YOU "YE-YE VONNEL"?